Review: 2013-06-22, some good exchanges but the fight between Adrien Broner and Paul Malignaggi was not so exciting: it gets two stars. The undefeated Adrien Broner (26-0-0, 22 Kos=85%) entered as the No.1 lightweight in the world while Paul Malignaggi (32-4-0, 7 KOs) entered as the No.20 welterweight. 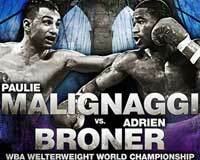 Broner vs Malignaggi is valid for the WBA World welterweight title (Broner’s first fight in the welterweight division – 147-pound limit). Watch the video!